Last night I had a chance to go to Lexington to see the University of Kentucky play Tennessee in basketball. As a diehard U.K. fan this was a real treat for me. The drive to Lexington and back is a pretty one. At one point the road skirts one of my favorite places to photograph in Kentucky—the Red River Gorge National Geological Area. As I drove through this area yesterday, and then again this morning,I couldn’t help but recall my last photo trip there and what happened shortly thereafter. 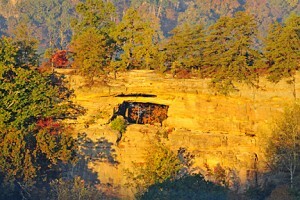 Having been inspired by the beautiful images of Auxier Ridge taken by my friend John Snell, I decided in October to visit this incredible area of the Red River Gorge located in the Daniel Boone National Forest. A friend and I left Pikeville early so that we could hike the two miles to the ridge for sunrise. It was an incredible morning! 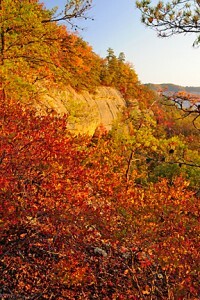 Fog lay in the valleys and as the sun began to rise there was glorious light cast on the colorful autumn foliage and sandstone ridges. I was able to take numerous images I really like that day. As the morning wore on we soon noticed that there was smoke rising from a number of campsites in the valley. This caught our attention because due to a recent drought there was a fire ban in the Gorge at the time. A couple of days later I learned that a fire broke out in the Gorge as a result of one of these illegal fires. An estimated 1,650 acres of some of Kentucky’s most beautiful scenery was torched. The trail to Auxier Ridge remains closed to this day and will be dangerous for a long time to come. Eventually the forest will recover but not in my lifetime. This makes me sad. I’m sad for myself but also for all the other people who will not have the chance to view what I did this past October. The Auxier Ridge fire reminds us that our actions do have consequences. This fire should never have happened. It’s not surprising it did, however, for it has been estimated that over 200 illegal fires were lit during the ban in the Gorge. How could that many people be that selfish or irresponsible? I ask this question and yet millions of people are treating the earth today in the same exact selfish and irresponsible way. We have developed a mindset that anything that benefits “me” is permissible. We feel we can pretty much do with the earth anything we want. This past Sunday we read in my church Psalm 24:1 which says, “The earth is the Lord’s, and everything in it, the world, and all who live in it.” We really do need to remember that the earth is the Lord’s, not ours. At a Creation Care workshop this past Saturday in Frankfort, KY, I heard Matthew Sleeth speak on our responsibility to the earth. He asked if God were to give us a brand new car to borrow would we bring it back to him later on all beat up and battered? Or would we try to take care of it? I think the answer is obvious and, yet, we are constantly beating up the earth as though it were not a wonderful gift from God on loan to us. 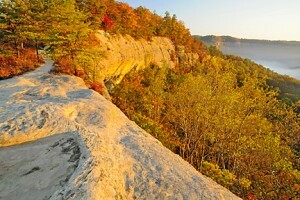 I’m angry at those who caused the fire in the Red River Gorge this past fall. There’s no excuse for their selfishness and irresponsibility. But what my drive to Lexington and back has also reminded me of is that there is no excuse for my own selfishness and irresponsibility when it comes to seeing Creation as God’s gift to us and my call to be a faithful steward of it. We simply cannot continue to live and act as though there are no consequences to our actions!